In a country obsessed with stick and ball sports, racecar drivers have been slow to gain acceptance into the mainstream of the sports culture. The explosive success of NASCAR’s top divisions have helped change that somewhat, but sadly many short track legends have been left out in the cold when it comes to recognizing their accomplishments. So when a mainstream sporting Hall of Fame notices the accomplishments of one of its state’s best Modified drivers ever, it is a reason for all short track fans to feel good. On March 31st, Ed Flemke will be inducted into the New Britain Sports Hall of Fame along with seven other sporting figures. Among those receiving the same honor as the racer will be two pre-World War II football players, one of the most notable Boston University track stars ever and Bernadotte "Bert" Loomis, who developed the dribble in basketball. 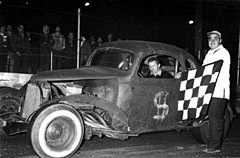 Flemke passed away in 1984, but his son Eddie Flemke Jr., is a well known name to modern race fans as a top competitor on the NASCAR Whelen Modified Tour. Flemke, Sr. was well known by his nickname, “Steady Eddie.” He typically picked big races and went after checkered flags in those events. 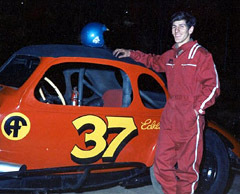 He won approximately 500 races including the Spring Sizzler at Stafford Motor Speedway (CT) and the Thompson 300. He was also known for his willingness to help young drivers and when Pete Hamilton won the 1970 Daytona 500, he invited Flemke up to the press box and told the assembled reporters that he owed the victory to his mentor. This will not be the first Hall of Fame that Flemke will be in. 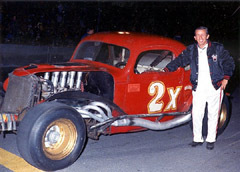 He was inducted into the New England Antique Racers Hall of Fame in 1998 after helping to found that organization before his death. Several members of the Flemke family will be attending the New Britain induction ceremony. The fact that it is the hometown Hall of Fame that Flemke will be inducted into is something that Flemke, Jr. knows would be very special to his father.